A quick to make sweet, Sooji Halwa is often made during the festival season as an offering (Prasad) to the God. The Indian festival season begins with the ten days of Ganpati and goes on till Diwali. What better way to celebrate the festivities and life than to enjoy it with good food. I often made Sooji Halwa for my kid as an after school snack. I also remember my mom making it when we had unexpected guests at home. A plate of onion pakoras, sooji halwa on the side along with tea were also a staple on rainy days. The dish is very easy to make and I haven’t met a person yet who dislikes sooji halwa. Once while I was making Sooji Halwa my aunt was with me and she suggested I add a table spoon of Besan (chick pea flour) while roasting the rawa and her tip took this already very tasty dish to an entirely new level of taste. Semolina is the coarse, purified wheat middlings of durum wheat used in making pasta, breakfast cereals, puddings, and couscous. Semolina made from durum wheat is yellow in color. Semolina is often used as the base for dried products such as couscous, which is made by mixing roughly 2 parts semolina with 1 part durum flour (finely ground semolina). In Slovakia, Sweden, Estonia, Finland, Lithuania, Latvia, Poland, Romania, Ukraine and Russia, it is eaten as breakfast porridge, sometimes mixed with raisins and served with milk. In Swedish it is known as mannagrynsgröt, or boiled together with blueberries, as blåbärsgröt. In Sweden, Estonia, Finland and Latvia, for a dessert usually eaten in summer, semolina is boiled together with juice from berries and then whipped into a light, airy consistency to create klappgröt (Swedish name), also known as vispipuuro (Finnish name) or mannavaht (Estonian name) or uzpūtenis (Latvian name). In the Middle East, it is used to make desserts called harisa, or so-called basbosa or nammora. 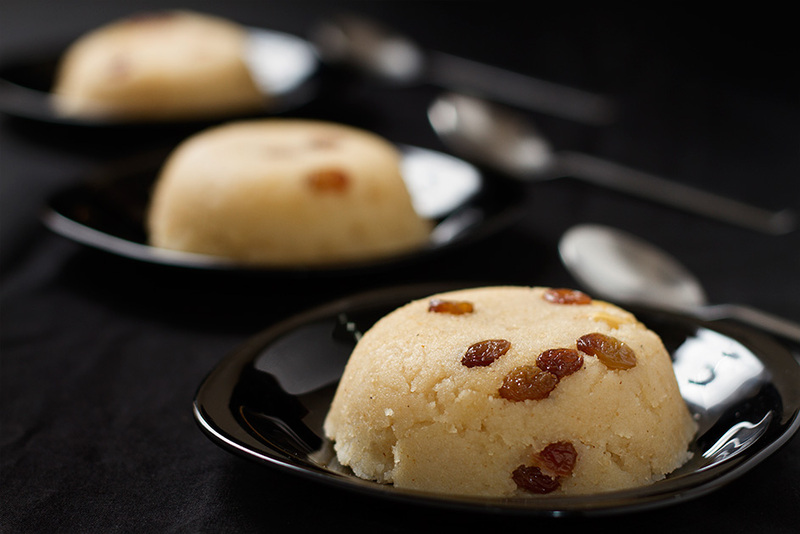 In Pakistan and India, semolina is used for such sweets as Suji Halwa and Rava Kesari. Such a preparation is also a popular dessert in Greece (halvas) and Cyprus (halvas or helva). In Greece, the dessert galaktoboureko is made by making a custard from the semolina and then wrapping it in phyllo sheets. In Cyprus, the semolina may be mixed also with almond cordial to create a light, water-based pudding. In Turkey (“Helva”), Bulgaria (“Halva”), Iran (“Halva”), Pakistan (“Halva”), and Arab countries, halawa is sometimes made with semolina scorched with sugar, butter, milk, and pine nuts. Heat a wide pan and add ghee. After the ghee melts, tip in the semolina and besan and roast on low flame. Remember to keep stirring else the mixture will stick to the bottom and burn. After about 10 minutes add cashews and raisins. By the end of 15 minutes, the semolina will change colour and give out a pleasant aroma. At this time add Sugar and continue to roast for a couple of minutes. Add water and cardamom powder while continuously stirring the mixture. Soon all the water will get absorbed by the sooji and your sooji halwa will be ready to be served hot. WOW! Love the presentation. Its yummy!